Thanks for signing up! We'll Email you more info about the Teradek RT ACI as it becomes available. The Teradek RT ACI is a RED DSMC2® module that reimagines camera control and management with an intuitive UI, tactile push-button and jogwheel controls. The MDR.ACI include our 2.4 GHz FHSS radio, which can cut through the toughest interference at a distance of up to 5000 ft.
ACI offers camera operators a new way to interact with their RED camera. Configure start/stop, shutter speed, color configuration, and more with a more intuitive, easy to use interface. ACI’s machined-aluminum chassis is super lightweight, but extremely tough, allowing you to operate in the harshest conditions without concern. The MDR.ACI incorporates a Teradek RT 3-channel MDR, giving you unparalleled wireless lens control performance in a lightweight, integrated package. Touchscreens are not always ideal for production environments, so we incorporated tactile push-button and jogwheel controls to make the configuration experience less frustrating and far quicker. Configure RED parameters with ease in even the toughest of production environments. ACI transforms RED’s touchscreen menu into smart physical controls so you can quickly change settings without disrupting the flow of the shoot. The ACI module simplifies camera control and management by combining a smartly-designed software UI with physical controls. The hardware attaches seamlessly to the side of RED DSMC2 cameras and can operate with any DSMC2 I/O module with a CRTL (RS232) port. 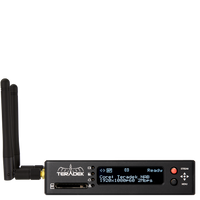 The MDR.ACI is a 3-channel Teradek RT wireless lens control receiver. Combine the MDR.ACI with Teradek RT lens motors and controllers for an all-in-one, cutting edge wireless lens and camera control solution.